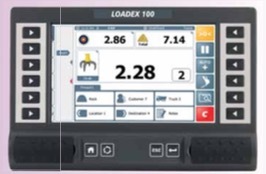 Making its debut at the SCOTPlant exhibition, which is due to take place in Scotland, UK, at the end of April, LOADEX 100 is a retrofittable scale. It is suitable for installation on both tracked and wheeled 360 degree excavators to weigh the amount of material in the bucket, grab or clamshell. The LOADEX system is easy-to-use and allows drivers to load correctly first time, eradicating trips to the stockpile and reducing vehicle and tyre wear and maximizing tonnes per hour performance. Also on display at SCOTPlant will be the LOADMASTER a100 on-board weighing scale for wheel loaders. Now approved for commercial transactions, LOADMASTER a100 is a CAN-based system combining cutting-edge sensor upon completion. The system can be one or two-way and is designed to operate fully automatically and without changing the loading routine for the mobile operator. iSOSYNC can also be remotely accessed utilizing standard query language (SQL), acting as a bridge module between the on- board weighing system and a customer’s existing load management software package. For smaller loaders and skid-steers, RDS offers the WEIGHLOG a10. This instrument is a user friendly on-board technology and signal processing techniques. The LOADMASTER a100 provides precise and consistent bucket weight information and emphasizes the gains in productivity and profitability. Another product to be shown for the first time in the SCOTPlant arena, is the recently launched iSOSYNC PC software, designed to enable control of load-out operations, inventory, productivity and traceability management. iSOSYNC can be used with either LOADMASTER a100 or LOADEX 100 and allows the rapid transfer of job information from a central computer to the loader or excavator. The resultant load information is sent back to the PC weighing system which provides accurate and consistent bucket and total load results, meaning stock management and check-weighing operations can be controlled more effectively. Another new product on show at SCOTPlant will be the LIFTLOG 1000, designed specifically for forklift trucks operating in the fastest loading environments. With the ever-increasing focus on productivity and safe- loading, the new LIFTLOG 1000 is a cost-effective weighing instrument that reduces loading cycle times and maximizes tonnes per hour performance. All of these systems will also be exhibited at the Bauma 2016, which will take place in Munich, Germany, in mid-April.